Birthday Blast 12x12 Quick Book Pak is perfect for making beautiful layered, trendy, colorful albums in minutes! Includes 7 different Quick Page templates, 5 decorated framed clusters, and 4 chippy chalk titles. The frame clusters are for 1, 2, and 3 photos on a page. Re-use and rotate any of the pages or frames for oodles of different options. 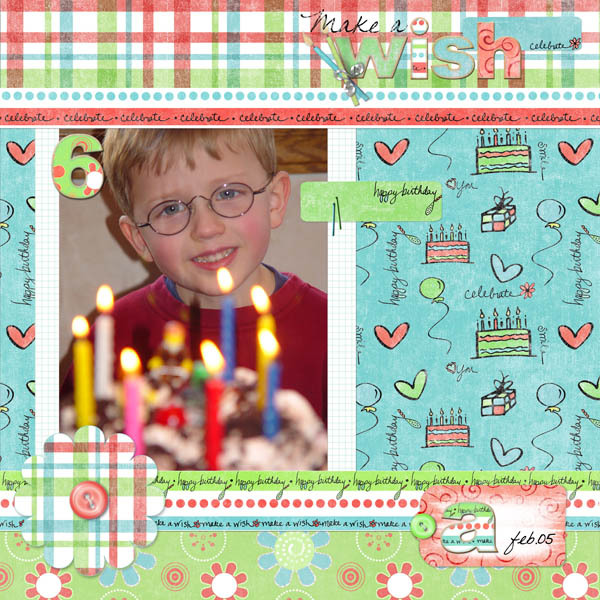 Use these adorned frame clusters with any other kit or paper pak, as they are SO versatile! Check out our coordinating Birthday Blast Paper and Elements Paks to make more coordinating pages. Quick Page Templates are layered paper backgrounds for you to add photos, frames, and other elements on top. Reverse or rotate templates to automatically quadruple the number of different pages you can make...you can even change the colors of each template (each background is only one layer, so color is changed on the whole page at one time, unless you select specific portions with a Selection Tool). Click on image to enlarge. See our gallery under the Downloads>Calendar/Album category for layout samples.